We like to see some traditional symbols every now and then when we’re spinning the reels – it reminds us of the old days before the internet made everything so mush easier. So there’s plenty to like about Astro Fruit from Openbet, a simple but colourful online slot with a progressive jackpot to add to the fun. 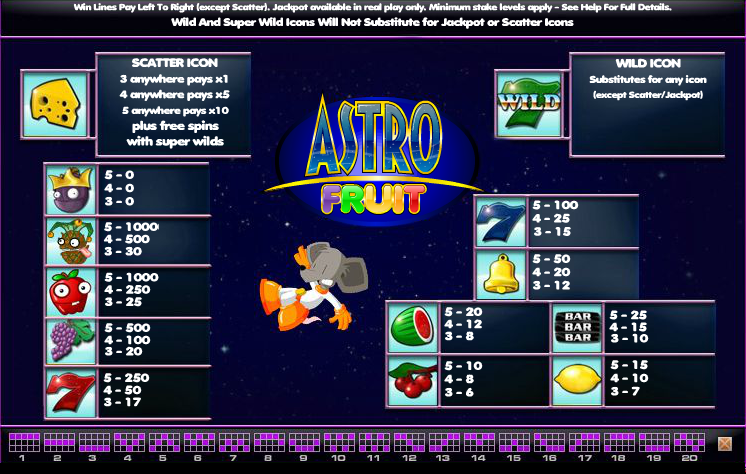 Astro Fruit is a five reel and twenty payline game and as the title suggests, the theme is one of fruit in outer space – you can just see a view of the stars either side of the reels. The basic symbols are the fruity ones we mentioned earlier and include lemons, cherries, triple bars, melons, bells and blue sevens. More valuable are red sevens, grapes and then three fruits with little faces – an apple, a pineapple and a plum with a crown. A lump of cheese is the scatter which activates the main feature and there’s also a green seven wild. This is the game’s only extra diversion and to trigger it you will need to land three or more of the cheese scatter symbols anywhere on the reels. Now you need to select from the displayed boxes to determine the number of free spins; each box has a number behind it and these will be totalled. When you find ‘Begin Free Spins’ the feature will start. Super Wilds appear during the spins, they have a number attached and they will remain in place on the reels for that number of spins. If you can land several Super Wilds it usually means a decent win. You can’t re-trigger the spins from within the feature. 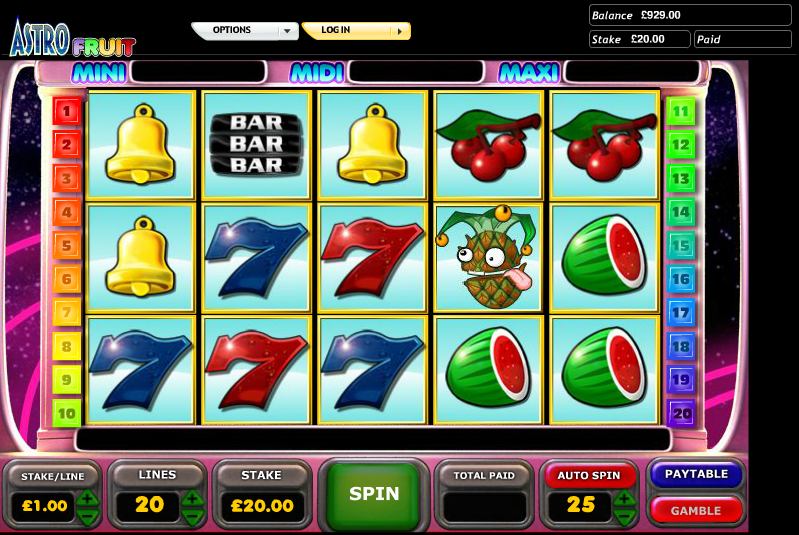 You can see the available jackpots above the reels and they are titles Mini, Midi and Maxi. The way to win them is to land three, four of five of the crowned plums on a winning payline for the big bucks. Every win can be gambled by clicking the ‘Gamble’ button underneath the reels; you can try to double or quadruple your win by correctly guessing whether the next playing card drawn will be the right colour or suit. You can only win the progressive jackpot by matching symbols on an active payline so for the best chance, play with maximum paylines. This is an entertaining and cheerful slot which makes you want to keep pressing the ‘Spin’ button. It’s a little hard to trigger the free spins but the chance of a progressive jackpot makes up for any deficiencies.